Score one for medical cannabis: In a major victory for medical marijuana patients and their allies, the United States government is dropping its forfeiture case against the world’s largest pot dispensary, Harborside Health Center in Oakland. According to a Tuesday release from Harborside, federal prosecutors are dropping their years-long effort to seize the property leased by Harborside in Oakland. The forfeiture attempt was part of the broad federal crackdown on California medical marijuana businesses starting in 2011. Since, the crackdown has come under fire from local, state, and national lawmakers as an example of federal overreach on the issue of state-legal medical marijuana. Harborside founder Steve DeAngelo stated that the new federal agreement to dismiss the forfeiture action is part of the end cannabis prohibition in America. "When US Attorney Melinda Haag first filed suit to seize the property Harborside is located in, I vowed we would never abandon our patients who— and predicted Harborside would outlast the efforts to close us down. Today, thanks to the deep support of our community and our elected officials, and the skill and determination of our legal counsel, that prediction has come true. We believe this dismissal signals the beginning of the end of federal Prohibition; and thank our patients, staff, and supporters everywhere for help achieving this historic victory," DeAngelo stated. Haag and three prosecutors in California threatened hundreds of property owners with seizure during the crackdown, including the landlord of Berkeley Patients Group in Berkeley. That practice should be ending, said Harborside attorney Henry Wykowski, in a statement. "We are gratified that the Government has finally seen fit to lay down its arms against Harborside in this case. 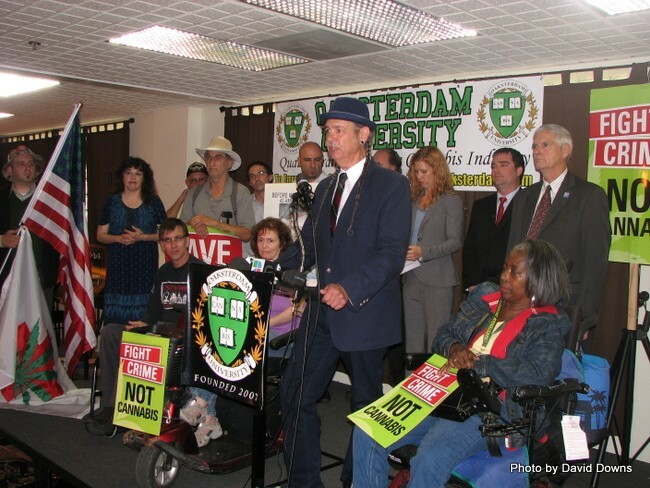 The will of the people is for medical cannabis dispensaries to operate free from federal threats of closure. We hope we are on the cusp of a policy change and that the Department of Justice will no longer target state-legal dispensaries for forfeiture," Wykowski said. Oakland led the world in permitting, taxing and regulating medical cannabis dispensaries, enduring federal intimidation long-before other cities, states and nations followed its lead, noted Councilmember Rebecca Kaplan. "As someone who advocated for Oakland’s nation-leading system to permit, tax and regulate cannabis facilities from the beginning, I have been very pleased at their success in providing clean and safe facilities that contribute positively to the surrounding community. Harborside Health Center has been a strong positive presence in Oakland, both for the patients they serve, the workers they employ, and for the vital public services that are supported by their tax revenues. I am glad that Oakland’s work on the Federal case helped keep Harborside open during this dispute, and heartened to know that the threat against them is now removed." Representatives of Harborside and the city of Oakland hold a press conference Tuesday morning to discuss the dismissal of the forfeiture action. The federal dismissal comes just weeks after the U.S. dropped its case against Lynnette Shaw — one of the first medical pot shop operators in California. Shaw's attorneys used as a defense a new Congressional law championed by Huntington Beach Rep. Dana Rohrabacher and Re. Sam Farr — which made it illegal for the Department of Justice to spend any money interfering with state-legal medical cannabis — effectively creating a cease-fire in the federal war on medical marijuana. That cease-fire appears to be taking hold.